The West Sound maritime climate is well suited for growing clematis. 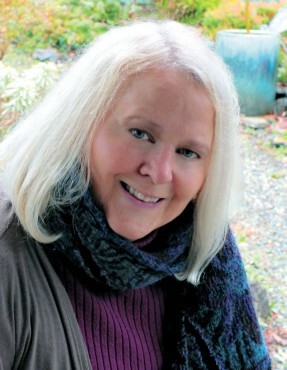 With proper pruning and attention to their few requirements, almost anyone can grow them on the greater Kitsap Peninsula. 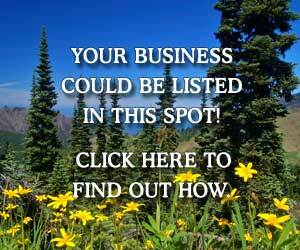 At one time, common recommendations for growing the vine said to keep the roots shaded and cool. 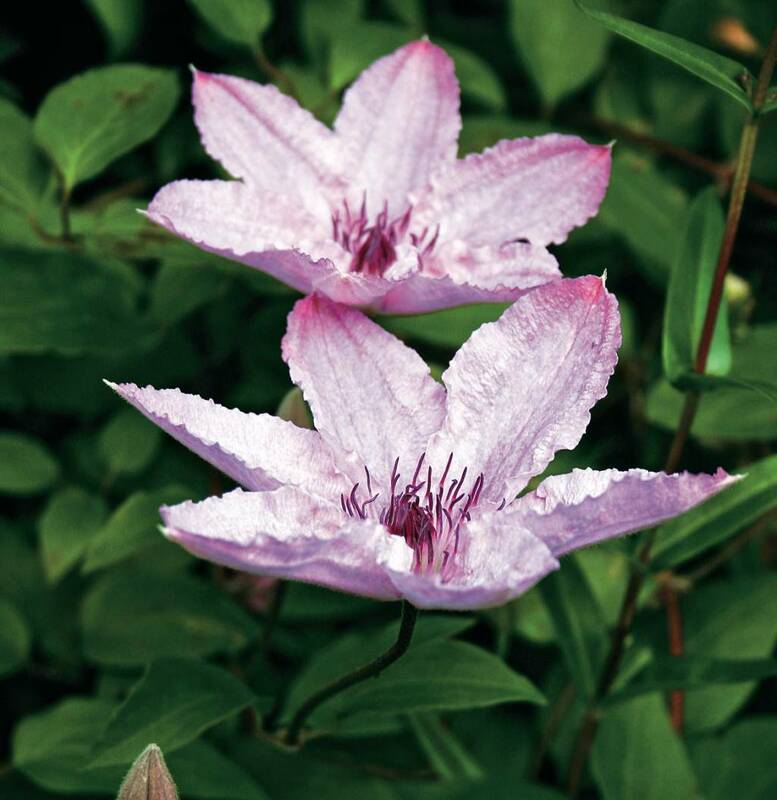 You can grow clematis with sun at its roots; however, adding organic mulch as a side dressing around the roots assists the vines by helping retain moisture, keeping weeds down and building healthy soil. 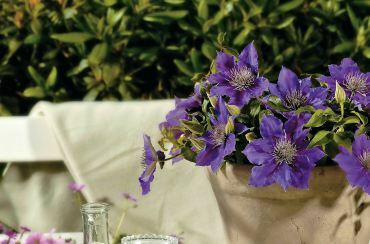 After planting your clematis, don’t be distressed when it appears to grow slowly and doesn’t bloom the first few years. Below the soil, the plant is sending its energy into establishing a healthy root system. 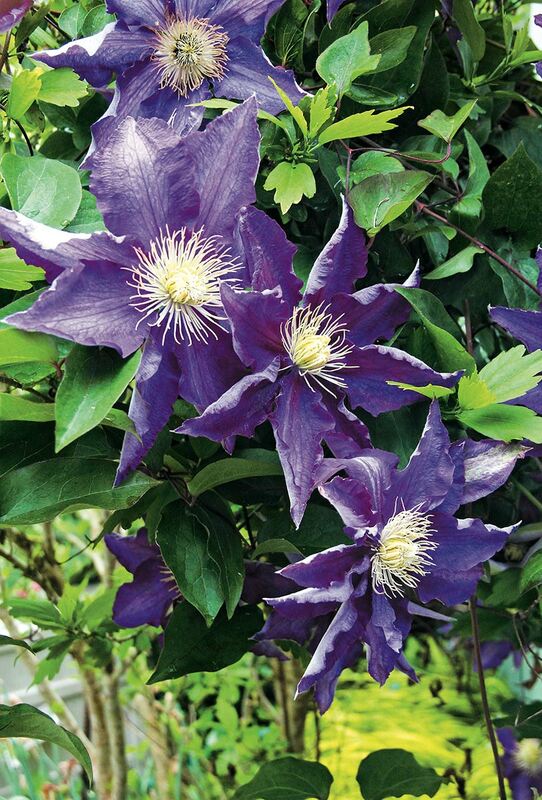 By the third year, the clematis rewards your patience and care with substantial growth and vast amounts of blooms for many growing seasons thereafter. 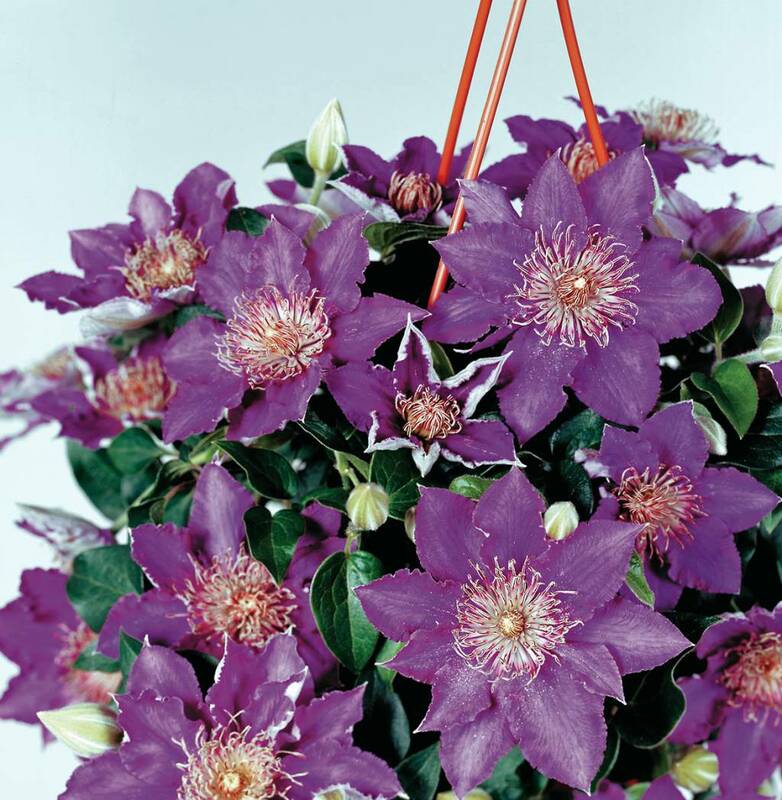 Clematis Luisa and Kassia — from the Miniature Clematis Flora Series come two exciting new varieties for hanging baskets and container growing that we should see in local garden centers soon. 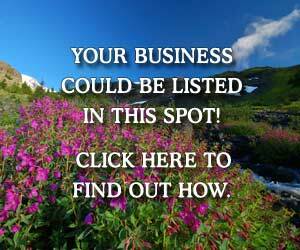 Ground cover or container culture. No pruning necessary. 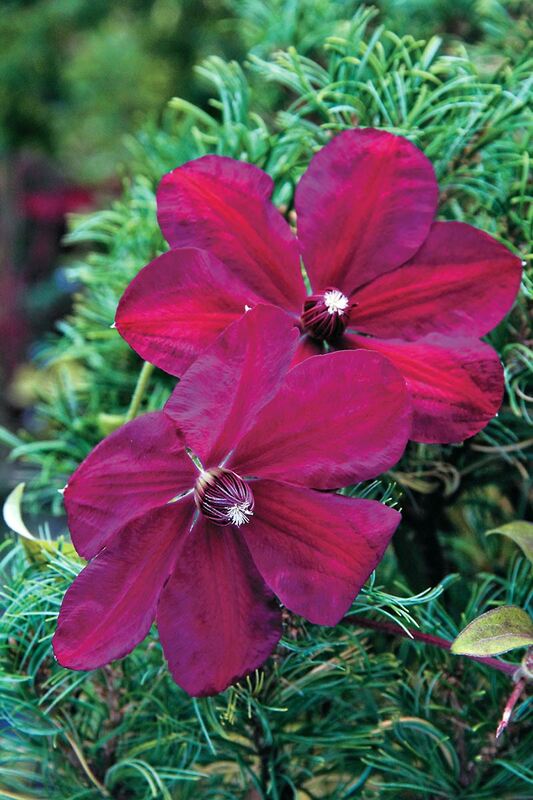 Clematis “Westerplatte” — flowers have overlapping, deep, rich rose-red tepals with recurving tips and red bars down the center. Red stamens and creamy white to yellow anthers offer a handsome contrast with the flower petals. Garden or container culture. 6 feet; pruning group 2. Clematis “Hakuòkan” — translated from Japanese, it means “white royal crown” and refers to the striking creamy-white stamens. Flowers have deep, rich, royal purple, single flowers consisting of seven to eight pointed tepals with creamy-white stamens. Semi-double flowers sometimes occur. Garden or container culture. 6-8 feet; pruning group 2. Clematis alpina “Helsingborg” — flowers are 2-inch long, with deep bluish-purple pointed sepals, and purple stamens on nodding, slightly twisted, bell-shaped flowers. Attractive, silky seed heads follow the flowers. Garden culture. 8-10 feet; pruning group 1. Clematis “Hagley Hybrid” — lavender-mauve tepals and red anthers on 3- to 4-inch single flowers. 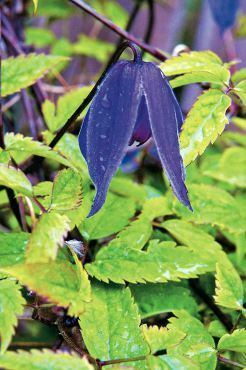 Grow in partial shade to prevent the flowers from fading too quickly. Garden culture. 8 feet; pruning group 3. 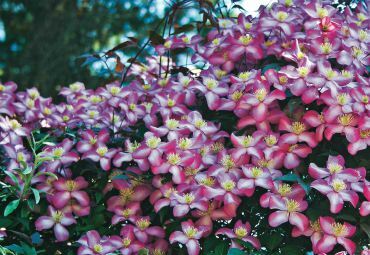 Clematis montana “Freda” — fragrant, cherry pink, anemone-like flowers have a light pink bar running down the center of each tepal and yellow anthers. New leaf growth has dark purple foliage. 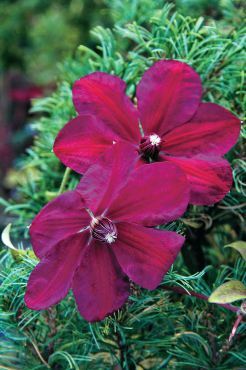 This vine is less rampant than other C. montanas — a good choice for smaller gardens. Garden culture. 13-20 feet; pruning group 1. Clematis integrifolia “Hakuree” — the gardenia-scented, bell-shaped, nodding flowers have pointed tips, which outwardly recurve. On the cooler end of the growing season, the sepals are bluish white and when warm air arrives later in the summer, the sepals are white. This one is not a climber, but can lean on other plants or let flop on the ground. Garden or container culture. 24-30 inches; pruning group 3.